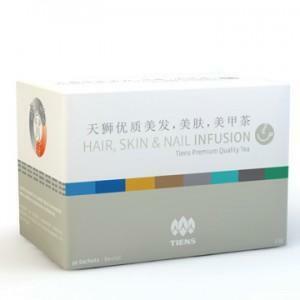 The Tiens Hair, Skin & Nail Infusion contains the prized Horsetail plant, renowned for its high silica content which is believed to help promote the re-mineralization and toning of connective tissue. The biological silica involved in the synthesis and repair of collagen plays an important role in the prevention of hair loss and improves the resistance of our collagen to ageing and environmental aggressors, by promoting the formation of cross-links in the protein keratin. This leads to the improved strength of the keratinous tissues including hair and nails. The Tiens Hair, Skin & Nails Infusion is a source of silica, which can help promote the regeneration of collagen and increase the strength and elasticity of the extracellular matrix. - Take 2 to 3 cups per day. - Infusion carefully prepared from selected natural raw materials, without additives or preservatives.